Take advantage of the years when your family travel plans are not limited by school holidays and summer vacation. Coconut Bay Beach Resort & Spa, St Lucia. At this Caribbean Resort, children will learn about their destination through activities designed for each age group. The SCOUTS program – Seeing, Crafting, Observing, Understanding, Tasting, St. Lucia) is infused in the fun you’ll find headquartered within the 50,000 square foot Cocoland Kidz Club. Expect youngsters to access a mini zipline and rock wall, a petting zoo and plenty of water play. Three of five resort pools cater to kids and include a lazy river and a zero entry splash pool. Savvy youngsters can order colorful slushies and fruity drinks at their own swim up bar. When parents opt for a night on their own, kids can enjoy their own Pirates Night or Movie Night on the Splash Lawn. There is nothing like an afternoon splashing in the surf and building sand castles to wear out an active toddler. At the FDR Resort in Runaway Bay, Jamaica, once Junior goes down, a Vacation Nanny is available to sit by his side, while you enjoy an afternoon playing golf, scuba diving or exploring by kayak. Check in to this all-inclusive seaside getaway, and meet your CPR-trained Vacation Nanny who will assist you and your family in having the most relaxing time possible. Trained in child care and housekeeping, this professional staff member’s goal is to fill in where needed, whether by looking after youngsters in the pool, or making sure the kids’ favorite snacks are on hand in the room. Contact: www.fdrholidays.com. Loews Miami Beach Hotel, Miami Beach, FL. This oceanfront resort, the recipient of a recent $50 million redesign, offers a bounty of family enticements via the Loews Loves Kids program. Families can choose to enjoy the benefits of direct beach access (which makes castle building a breeze) or head to the zero entry pool where pop fountains add to the vacation vibe. Celebrate in style by spending the day with access to a SOAK cabana where air conditioning, flat screen TVs, private butler service and rooftop terraces will convince the kids they’ve reached VIP status. Take a pizza-making class together or take advantage of Family Happy Hour during which time kids can enjoy complimentary lawn games while parents sip cocktails, join in or cheer them on. For families that check into The Coral, the resort’s recently revamped, family-centric tower, a new level of luxury awaits. Compare notes with the Kids Concierge and in a flash, the dreams of mini-travelers (and their parents) will soon be a reality. From scheduling family swims with the dolphins to registering for Sea Squirts, an interactive marine program where youngsters can feed baby stingrays, sharks and schools of fish, the concierge is on hand to help create itineraries and smooth any bumps on the path to a memorable vacation. Ask about helping the Atlantis Aquarists guide Green Sea Turtle hatchlings to the sea. Getting kids outside early and often is likely to instill a lifetime love of nature. Visit a local trail and watch as your child explores with wonder, turning over rocks and observing small animals and birds. Choose a loop trail or plan a scavenger hunt. Bring along a picnic and plenty of water or juice so that the whole family stays hydrated. After a few close-to-home practice rounds, include nature walks and hiking in your family vacation travel plans. In time, you’ll be scaling heights. When it comes to family travel, you might be wondering where to stay that will keep your teens and toddlers smiling? From manicures to “mocktails”, the options for teens have multiplied significantly in the last decade. Many resorts now offer uber-hip, teen-only spaces, providing a contemporary hang out for dancing, games and music. Atlantis Resort in the Bahamas led the way with their swanky 14,000 square-foot club Crush. 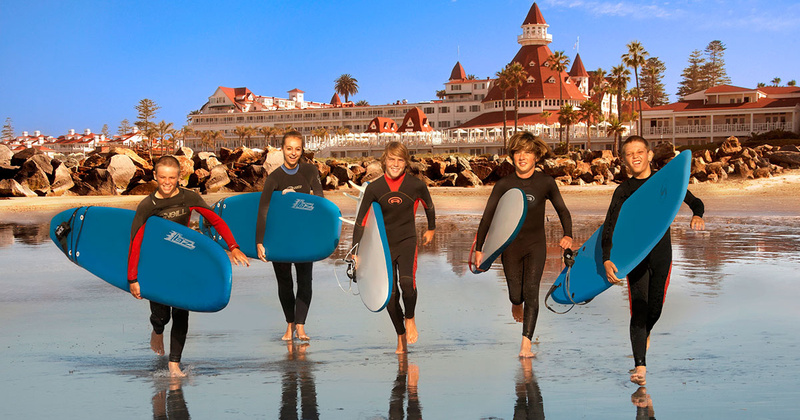 San Diego’s Hotel Del Coronado’s features the popular, teen-only Vibz. Your teens will be all smiles when you check into the JW Marriott Starr Pass Resort . They’ll be quick to check out the new Blur lounge where Play Station and “PopTails” are underway. Are you a World War II veteran? Did you grow up inspired by jazz or classical music? Did the ethnic neighborhood of your youth greatly influence the person you are today? Visit a war memorial, take in a concert or music festival or visit the old stomping grounds. Take the opportunity to share your experiences and knowledge with the kids. It will mean more to hear a bit of history from someone who has been there. And, remember, you are part of their history. snow shoeing, ice fishing or cross country touring. Find something that’s new to all of you and share the joy of learning together. For many, developing the plan is the hard part. There are travel consultants who specialize in helping families create intergenerational travel memories. They’ll serve up options ranging from cruises in the Galapagos Islands to fly fishing on wild and scenic rivers to train trips through the American West. However you choose to share time with your grandchildren, you’ll create treasured memories to deposit in your family’s history bank. Have you perused our Grandparent Travel Collection? It's a great resouce for finding just the right trip for you and your clan!